The insect's flight path can be wirelessly controlled via a neural implant. Cyborg beetle: Shown here is a giant flower beetle carrying a microprocessor, radio receiver, and microbattery and implanted with several electrodes. To control the insect’s flight, scientists wirelessly deliver signals to the payload, which sends electrical signals through the electrode to the brain and flight muscles. Watch controlled flights of the beetle. Beetles and other flying insects are masters of flight control, integrating sensory feedback from the visual system and other senses to navigate and maintain stable flight, all the while using little energy. Rather than trying to re-create these systems from scratch, Michel Maharbiz and his colleagues aim to take advantage of the beetle's natural abilities by melding insect and machine. His group has previously created cyborg beetles, including ones that have been implanted with electronic components as pupae. But the current research, presented at the IEEE MEMS in Italy, is the first demonstration of a wireless beetle system. The beetle's payload consists of an off-the-shelf microprocessor, a radio receiver, and a battery attached to a custom-printed circuit board, along with six electrodes implanted into the animals' optic lobes and flight muscles. Flight commands are wirelessly sent to the beetle via a radio-frequency transmitter that's controlled by a nearby laptop. Oscillating electrical pulses delivered to the beetle's optic lobes trigger takeoff, while a single short pulse ceases flight. Signals sent to the left or right basilar flight muscles make the animal turn right or left, respectively. Most previous research in controlling insect flight has focused on moths. But beetles have certain advantages. The giant flower beetle's size--it ranges in weight from four to ten grams and is four to eight centimeters long--means that it can carry relatively heavy payloads. To be used for search-and-rescue missions, for example, the insect would need to carry a small camera and heat sensor. In addition, the beetle's flight can be controlled relatively simply. A single signal sent to the wing muscles triggers the action, and the beetle takes care of the rest. "That allows the normal function to control the flapping of the wings," says Jay Keasling, who was not involved in the beetle research but who collaborates with Maharbiz. Minimal signaling conserves the battery, extending the life of the implant. Moths, on the other hand, require a stream of electrical signals in order to keep flying. The research has been driven in large part by advances in the microelectronics industry, with miniaturization of microprocessors and batteries. Mais faut-il vraiment s'en étonner lorsqu'il s'agit de recherche militaire? On rappelera toutefois que les laboratoires du DARPA nous ont amené Internet (avec ARPANET comme ancêtre --discuté par certains, seul le TCP/IP ayant été mis au point dans les laboratoires du DARPA--) et le GPS. This paper describes two wireless power transfer systems. The Wireless Identification and Sensing Platform (WISP) is a platform for sensing and computation that is powered and read by a commercial off-the-shelf UHF (915MHz) RFID reader. WISPs are small sensor devices that consume on the order of 2uW to 2mW, and can be operated at distances of up to several meters from the reader. The second system harvests VHF or UHF energy from TV towers, with power available depending on range and broadcast transmit power. We report on an experiment in which 60uW is harvested at a range of about 4km. "The Intel Researchers set up a TV antenna on a balcony with line of sight to the KING-TV tower 4.1 km away. The TV station broadcasts on channel 48 between 674 and 680 MHz with an effective radiation power (ERP) of 960 Kw. The TV antenna used was a UHF log periodic with 5 dBi gain connected to a 4 stage charge pump power harvesting circuit of the same design as that found in an RFID tag. Across an 8 KOhm load the team measured 0.7V, corresponding to 60 microwatts of power harvested. That was enough to drive a thermometer/hygrometer and its LCD display, which is normally powered, by a 1.5 volt AAA battery." 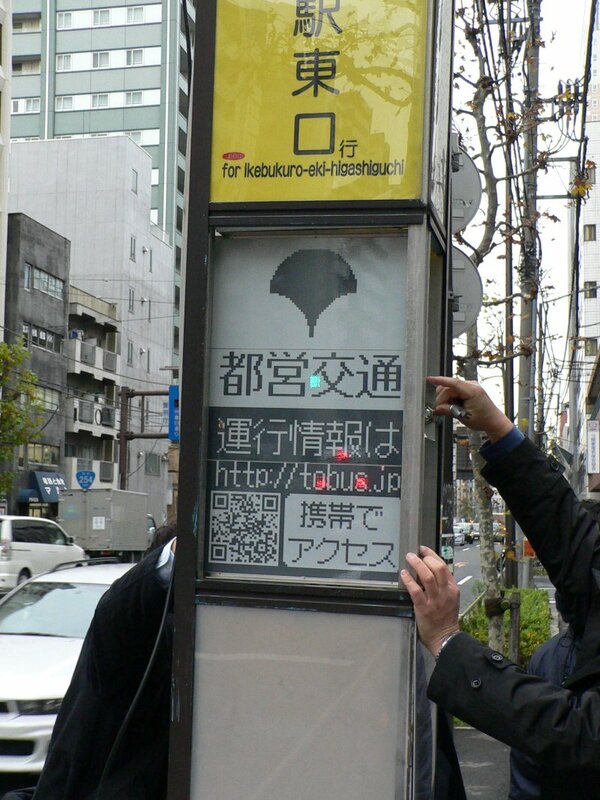 We’re used to seeing e-paper in sub-10-inch squares, slapped onto the front of an Amazon Kindle or Sony Reader, but over in Japan they’re experimenting with using the technology to give Tokyo residents large-scale disaster warnings and evacuation advice. Two installations were fitted, the first measuring 1 x 3.2m in a Post Office window, while the smaller second panel, at 60 x 40cm, was added to a bus-stop. A new wireless network was set up to feed information to the two panels, which will be on display until January 29th. The larger screen - which is in fact made up of forty 48 x 96-pixel panels, adding up to a total 240 x 768 resolution - consumes around 24W, while the smaller - made up of three stacked 48 x 96-pixel panels, adding up to 144 x 96 resolution - consumes around 9W. Each has a pixel pitch of 4mm. The e-paper was supplied by Toppan Printing Co Ltd, while the project as a whole was implemented by the Ministry of Internal Affairs and Communications Kanto Bureau of Telecommunications. 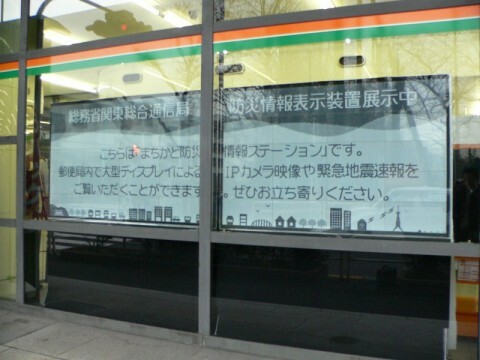 It remains to be seen whether e-paper will be adopted as permanent signage. Les displays e-paper ou autre e-ink sortent du confinement des petits écrans qui semblaient leur être réservés. Une véritable solution à la mise en place de panneaux à affichage variable sans pour autant devoir faire face à plus de dépenses énergétiques, la particularité du e-paper ou e-ink étant de ne pas consommer d'énergie pour maintenir affichée une image statique, seule le changement du contenu génère une consommation d'énergie. OSAKA — Panasonic Corp said Wednesday that from February it will market four compact digital cameras capable of registering facial data in advance so that the cameras will automatically focus on specific people. With the function, users can take pictures of their relatives and friends in group photos more easily and can also input the names and ages of their children to record the process of their growth, the electronics giant said. Two of the four cameras are capable of shooting video in high-definition mode. Panasonic says this is a world first for a compact digital camera. It is also easier to play back the videos on a TV or a DVD player when these models are used, according to the company. The new cameras, which will be sold under Panasonic’s Lumix brand, will retail for an estimated 40,000 yen to 47,000 yen. The models without the high-definition function, ‘‘DMC-FX40’’ and ‘‘DMC-FX550’’ will debut Feb 20 and the high-definition cameras, ‘‘DMC-TZ7’’ and ‘‘DMC-FT1’’ will hit the market March 6. La boucle est bouclée. Les liens avec les réseaux sociaux en particulier et Internet en général sera fait et les plus paranoïaques d'entre nous imaginerons l'utilisation façon 'annuaire inversé' qui permettrait/permettra à partir d'une simple photo prise dans la rue d'obtenir des renseignements plus ou moins complets sur une personne totalement inconnue quelques secondes auparavant. BioArts International announced today (28.01.2009) that they have delivered the world’s first commercially cloned dog, a 10-week old Labrador named Lancey, to Florida residents Edgar and Nina Otto. Lancey was hand delivered to the Ottos on Monday, January 26th by BioArts Chairman Lou Hawthorne. “This is a very special milestone for our company – and great fun for me too,” said Hawthorne, who delivered Lancey personally. The Ottos were one of five families to bid and win an auction held by BioArts International in July for a chance to clone their family dog. Lancey’s genetic donor, Sir Lancelot, died in January, 2008, and the Ottos had his DNA stored. By October, samples from the original dog were on their way to the Sooam Biotech Research Foundation in Seoul, South Korea, which provides cloning services to BioArts. Lancey was born on November 18th, 2008, and brought to the US on January 25th, 2009 after being weaned from his surrogate mother. Additional information about the Best Friends Again program and dog cloning is available at www.bestfriendsagain.com. More information about BioArts is available at www.bioarts.com. BioArts International is a biotech company focused on unique, untapped markets in the global companion animal, stem cell and human genomics industries. The Best Friends Again program is a collaboration between BioArts and the Sooam Biotech Research Foundation in South Korea, home to the best and most experienced dog cloning team in the world. BioArts has been granted the sole, worldwide license for the cloning of dogs, cats and endangered species. The license was granted by Start Licensing, Inc. and applies to the somatic cell nuclear transfer (SCNT) cloning patents developed at the Roslin Institute for the cloning of Dolly the sheep.